Greetings from the good ship as we wake up back in the Bay of Islands. We had a short lie in this morning, then everyone was up for the early mineral spa (also known as the morning swim). Breakfast was had, dishes and chores were done, then on to a lesson in leadership with the team practising putting up the sails (sadly there is no wind for a real sail right now). Next up were some lessons teaching us all about the weather, tides, rules of the road and voyage planning. After this we went ashore with Jacob taking the helm on the dinghy , all good learning for everyone. 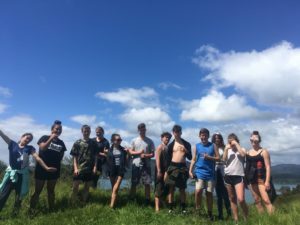 We had a big walk around Urupukapuka and enjoyed our sandwiches for a picnic lunch. We headed back on board at 14:00 and were lucky to be joined by dolphins for a while before we set up for Motuarohia (Roberton Island). Once we were there, there was plenty of fish and Jess caught a fish with her hands but released it as it was only little. Lots of fund was had playing the the lagoon where there is a snorkelling trail, and of course the awesome view from the top of the hill. Then it was time to have our 30 mins of silence to reflect on what we have achieved today. Everyone headed back to ship, with Rosa, Josh and Eloise swimming back. Then it was time to up anchor and head over to paradise bay for the night. Back on board there were a few more lessons on finances and phonetic alphabet. Everyone is starting to bond with each other as friendships are being formed with Josh proving to be the comic of the group! All are happy on board and we wish you Po Marie! LOL Josh being Josh. Hope all is well with everyone on board. Awesome updates – Thanks.